A new book from the Kansas City Federal Reserve calls for a comprehensive restructuring of the nationâ€™s workforce development policies and programs to better meet the human capital demands of employers. This compilation of submissions from some of the most prominent thought leaders in workforce development policy today, the Federal Reserve is wading into a relatively new area of research but one where it plans to continue being actively involved. â€œTransforming U.S. Workforce Development Policies for the 21st Century,â€ provides thoughtful perspectives on the system itself as well as how to redesign these strategies and evidence-based policies and practices. Generation Workforce: The Role of Career and Technical Education,â€ from The Manufacturing Institute, SkillsUSA and Educational Research Center of America. The study, which surveyed more than 20,000 high school students enrolled in CTE programs of study, also aims to provide insight into studentsâ€™ perceptions of the value of CTE preparation. Overwhelmingly (64 percent), students cited their own interests and experiences as the greatest influence on their future careers. The second and third greatest influences were a studentâ€™s father (22 percent) and mother (19 percent). Perhaps surprisingly, guidance counselors accounted for 3 percent â€“the least important influence on a studentâ€™s career choice. 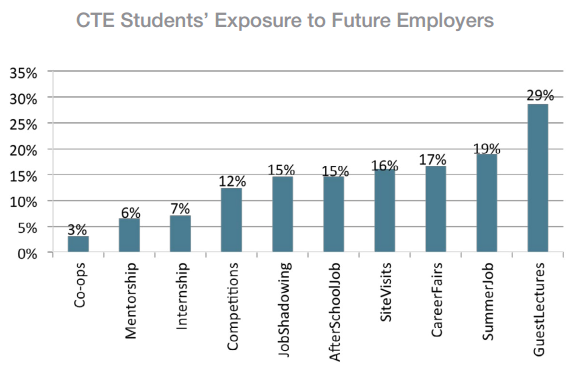 So how did students perceive the value of CTE preparation for the future careers? While 47 percent of all CTE students surveyed said that CTE has helped make their career choices clearer, that number rises significantly for CTE students who also participate in a CTSO or are members of SkillsUSA. Also, those students engaged in CTSOs are nearly 50 percent more likely to pursue a technical career in the field they are studying, according to the survey. Check out the report to learn about how students are exposed to future employers as well asÂ educatorsâ€™ perceptions of CTE. Also new from The Manufacturing Institute is a tool that can help educators make the case for work-based learning and employer partnerships. The tool â€“ a return on investment calculator â€“ is designed to help manufacturers calculate the cost of open positions within a company by factoring in costs across several categories including training, recruiting, human resources and operations. Building Career Pathways for Adult Learners: From the Joyce Foundation, an eight-year evaluation of the Shifting Gears initiative in Illinois, Minnesota and Wisconsin. Engaging Employers on Workforce Data: Case studies from the Workforce Data Quality Campaign about how employers are playing a significant role in developing and informing state data systems.